J R Controls provides control systems for customers with distribution systems. 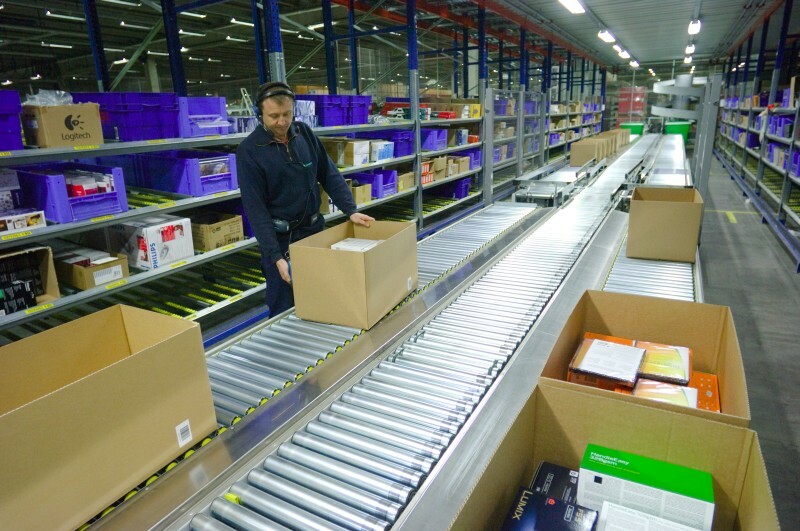 These systems typically include picking conveyors that transport cartons that are placed on the conveyors by operators. The cartons proceed to an accumulation and merge area where the various sources of cartons are combined and sent to a high speed sorter. The sorting system gaps the cartons and then sorts the cartons to the proper lanes for directly delivery to a waiting trailer or to a manual palletizing station. These control systems are typically PLC based and distributed utilizing remote control panels in the picking areas, control panels for the merge, and finally another control panel for the sorter and related conveyors. This architecture allows for easy troubleshooting and lower field wiring installation cost. These control systems typically utilize barcoding with either laser or vision based scanning systems to identify the cartons upon arrival at the sorter. J R Controls sorter control systems can communicate with a customer host system either directly or we can provide a WCS PC application to provide a link between the customer host system and the sortation controls.